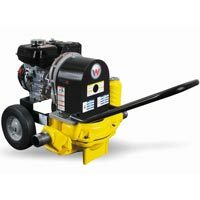 The PD 2 diaphragm trash pumps can move almost anything that flows. 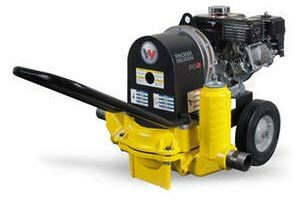 A 2-inch pump that can handle solids up to 1.5 inches (38mm) and up to 50 gpm (189 l/min), these pumps are ideal for moving water with mud, slurries and in seepage areas. Built with high quality component, you will be assured of many years of top performance and durability. Large solid rubber tires provide excellent traction and smooth rolling over rough terrain. Aluminum alloy body with heavy-duty pump diaphragm provides a lightweight, low maintenance package that ensures long life. Surge chamber on inlet side results in smooth pumping operation by absorbing pressure spikes while reducing wear. Oil bath lubricated transmission ensures continuous lubrication to all parts of the gear transmission system, reducing both maintenance costs and lost production time. Ductile iron crankcase provides maximum durability. Hardened forged gears extend pump life and provide efficient power transmission from the engine to the pump. Straight through water flow design provides high production pumping capacity and less down time blockages.